Can you tell me about the Wellbeing Centre and your approach to it? The wellbeing centre came about in response to concerns that boys are perhaps not getting enough emotional support, as is reflected in the fact that suicide is the leading cause of death for males aged between 15-24 years of age. Creating a facility that ultimately made boys feel very safe and comfortable was central to our approach. What were some of the challenges of the project? Apart from the obvious challenges inherent in working with a heritage-listed building, a key challenge was to maintain a sense of open space while also providing smaller, more intimate zones. The large hall was divided into two main areas – a large carpeted space which can facilitate large and medium-sized group presentations and workshops, and another similar sized space lined with timber flooring for mind and body activities such as meditation and yoga. An existing alcove that previously housed the chapel’s organ was transformed into an inviting meditation space. How difficult was it to create something that met the needs of boys at various ages and stages of their life? 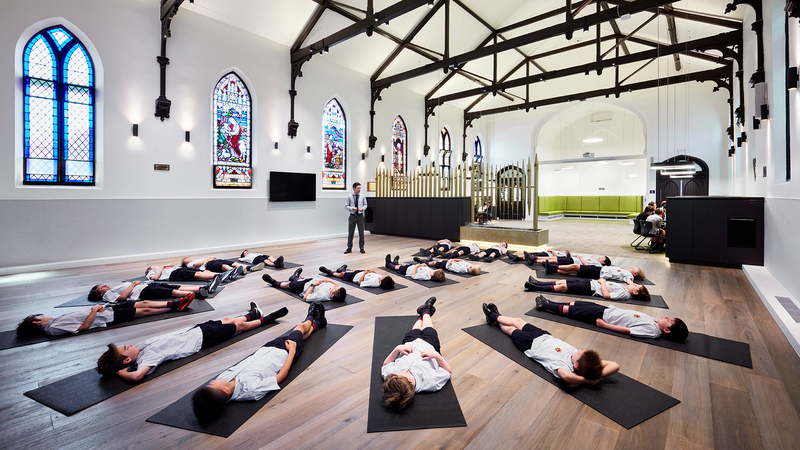 The Brighton Wellbeing Centre caters to students as well as school staff. Therefore, the design of the centre was focussed on accommodating a range of wellbeing-related activities. Having said that, we really worked hard to create a place that the boys would feel “gets them.” We also recognised that not every boy is inclined towards sports and aimed to create a quiet haven for boys who preferred activities that require quieter surroundings. The resulting space provides areas for both formal activities that help boys learn life skills such as mindfulness and relaxation as well as informal spaces that provide safety, comfort and refuge from hectic schedules, study pressures or personal difficulties. Can you tell me about the water feature and how the idea came about? The bespoke water feature, made from reclaimed organ pipes, pays homage to the historic use of the space, providing a tranquil gateway of sound and movement between the two key zones. From a practical perspective, it provides visual separation between the two main spaces, while the sound of running water is a form of white noise that creates a sound barrier as well as a very calming atmosphere. What were some key lessons you learnt from the project? The seemingly paradoxical aspects of combining a robust environment for boys with the more nurturing aspirations of the wellbeing centre were a great challenge. We introduced bold shapes such as the circular geometry of custom joinery and the ring-shaped pendant lights that define group discussion pods and create a sense of intimacy in what is otherwise a relatively large space. Feature wall and ceiling lights draw the eye up to highlight the rhythm of existing stained glass windows and across to the high ceilings and exposed roof trusses. The base palette of earthy materials and colours is complemented by tones of forest greens and browns with metallic highlights, providing a setting for contemplation and reflection. This light and bright interior promotes a sense calm and relaxation, health and wellbeing while maintaining a subtle masculinity. Looking back on your schooling, what do you wish had been better designed at the time in terms of architecture? I went through schooling when the traditional classroom was king – students sat in rows and the teacher stood upfront. These days’ education environments are much more focussed on the learner and they offer a range of spaces that are suited to different types of learning activities. I wish there had been what I call, “sticky spaces” that are designed to draw children in and help them to deeply engage in learning activities when I was at school. How do you think education will change over the next five years? Education will continue to change as rapidly as our world continues to change. However, the focus is currently on the “whole child,” creating resilient problem solvers who are capable of learning and growing through their failures and are engaged with the world around them. I hope education will move away from creating children who can produce the ‘right’ answer, towards producing children that are capable of being awesome. 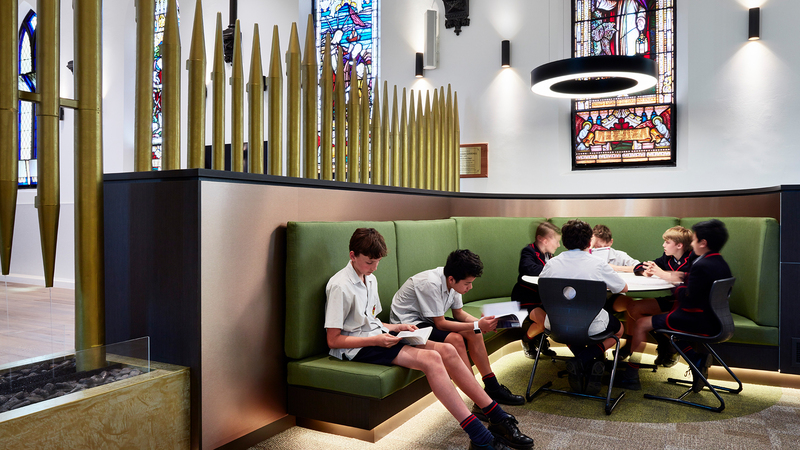 The new Brighton Grammer Middle School was a collaboration between architects and educators to create a facility that would support the diverse needs of boys over their crucial year 7 and year 8 years. Simon is part of an expert research panel, led by The University of Melbourne’s Dr. Ben Cleveland, for the research project which explores the idea of schools being used as community hubs and utilising them beyond the hours of 9.00am to 3.30pm. In an increasingly networked society and business world, successful and innovative developments are more often borne out of collaboration and partnerships than they are from keeping all of your cards close to your chest.